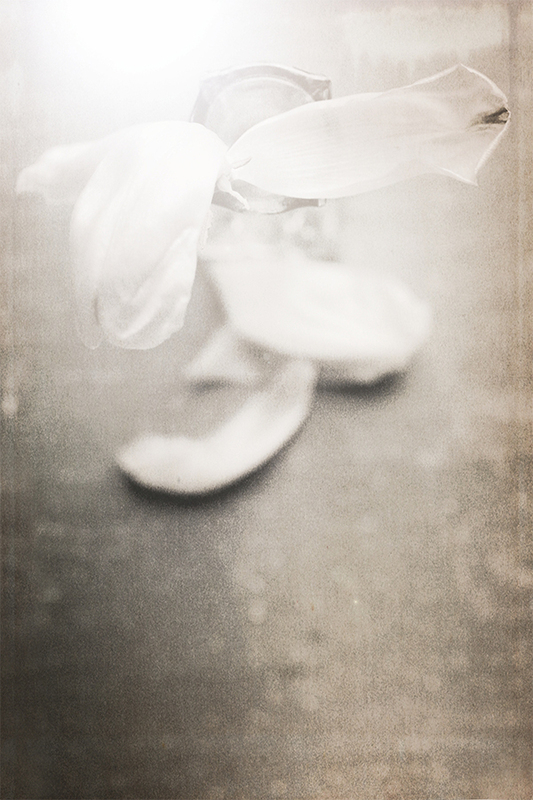 the white tulip fell apart somewhere in the night; somewhere it was dancing with raindrops and faint moonlight, dancing until it lost its shoes, waking to look like a hungover pinwheel with a smile on its face. from overhead it looks like a hastily tied bow or the softest of lamb's ears. it feels like silk. lately we are all about flowers and compassion. we walked in the rain last night and tell me two good things about someone who drives you crazy, she said. i was embarrassed to find only one, but one is a beginning; i will search for one more. she'd brought me the flower the day before, another broken white tulip for my little table, and the neighbor on the corner said we could break off branches of his hawthorn tree, all abloom with pink, to happy up our homes. good medicine in many ways. the rain keeps the world gray, but the daffodils light it up, the white dots of paperwhites, the spots on the hackberry tree. we walked in the light of almost night, alone on the streets, everyone else snug in their houses or smoking cigarettes on porches, turning up a street we seldom visit. her raincoat was the color of raspberries; she wore a black hat and looked like a character from dickens, her face glowing in the last of the day. there was the calling of owls and the sound of water running in the creek. time feels soft, easily broken. we set our clocks forward and it began to rain. this week looms large and long but will move faster than i right now think. it is another path i didn't see from the road, one i must draw on my map; i will use a pink crayon when i mark this new spot and toss fallen petals on its movement. i think i will stop and plant seeds as i walk. next year when she and i walk, there will be surprises of blossoms. such a very beautiful photograph - matches your very beautiful words.